People like to be entertained-Justin had 24 people (himself, 9 band members, 10 dancers, and 4 backup singers) on the stage doing there thing all night moving around and making sure at all times that those closest to them felt engaged. There is something to be said that he rarely went for the “I am good enough on my own to keep everyone interested” approach that most speakers do. The dancing, singers, and band added layers that most church music doesn’t even have. People want to feel that they had an experience-Justin at the end of the night talked to the crowd and had a family time almost recapping where they had been and thanking them for their involvement. It was genius because not only did he create an experience but he gave people mental ownership that they could feel proud and even re-tell to friends. People are made to worship-I am always struck by this when I go to a concert and this was no different. When we saw Tim McGraw it literally broke my heart to see a man raise his hands, close his eyes, and sing back to Tim as if he deserved it. People were made to worship God and try to fill it with whatever is it front of them…they have the need but we have to point them to Jesus. I am not cool. Doug Fields says that at 25 you will no longer be cool and he is right. I have 12,000 songs on my computer and she only could pretend that she liked 200 of them. I am old-She laughed when I asked her if she wanted a song from 2005 and said that is old. So what does this all mean for someone in youth ministry? Study up on culture. A youth pastor I respected told me once that he watches MTV every week and listens to and watches things that keep him in the know. That is a step in the right direction but isn’t the final piece. I can try to stay up on all the MTV, Facebook, and Jonas Brothers under the sun but it isn’t enough. We must involve the age group we trying to reach and effect in the planning, execution, and evaluation of our ministry and programming. This is not me point the finger at anyone but myself. I have learned this so much as an arrogant 25 year old. My age group thinks that we are cut out of planning and involvement in “big church” because we are young so we do youth ministry and than cut students off in the same manner. I am learning that I must now involve and empower students not just to do certain things at certain times but to be involved in my whole planning process from start to finish. I am already to old to be cool and when left to my self I will default to planning that reaches me and my 25 year old self in the same way that a 60 year old would plan a service not targeted at me. Hope this makes sense, just some stuff I have been learning and thinking! Although I am nervous that we won’t actually get the house (pray for me and my paranoia). I thought I would let you all know some of the reasons I am excited to have my first house.Reason #1 is that I finally get to not have my tools in multiple plastic toolboxes in a hallway closet like I have at our first two apartments. 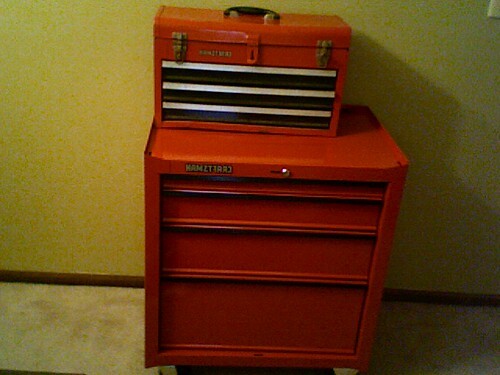 My mom bought me my first Craftsman toolbox for Christmas and now I can be organized, manly, and ready to “fix stuff” all in one magical package. It is small but I will add others as well as a workbench and different things hung on the wall. Timberlake’s second solo release, FutureSex/LoveSounds, was released in 2006 with the U.S. number-one hit singles “SexyBack“, “My Love“, and “What Goes Around… Comes Around“. The album also spawned three additional U.S. top twenty hits (“Summer Love“, “LoveStoned“, and “Until the End of Time“) making it the first time a male artist has achieved six top twenty hits from one album since Michael Jackson did so from 1991–1992, with his album “Dangerous“. It is hard to judge success anymore when Cd’s don’t sell, but that is it. In April I have been asked to lead a seminar for some youth pastors/workers in Northeast Ohio. I have some ideas and some direction but I was hoping you who read this could help me. What topic would you want discussed? What problems are you having? What would a youth pastor want/need to know when my 2 hours is done? Please leave feedback….. While I can’t pretend to be an expert in this area, I have done a couple of them now and thought I would share what I do know. Just this week I did my first draft for the 08-09 fiscal year. There are a few major things you have to look at when you are planning a budget. It won’t give you final answers, but these are questions that will at least begin to formulate a direction you are headed. I know it is cliché. I wish I could say I remembered this one up front every time but I am not that cool. The reality is though that you are spending God’s money to do God’s work so you NEED to stop and pray for the mind of Christ to work in your thoughts and heart. Everything you do including the way you spend money should be easily traced to how you are trying to accomplish that vision. 3. What are your ministry/church’s values? If you value certain things (for most it is some form of the five purposes and excellence, technology, etc. If you are saying you value it put your money where your mouth is (that was too cheesy to use) and prove it. EXAMPLE: Ours are Outreach, Worship, Connecting, and Service. Those along with Staffing to create them are my focus. 4. What was your budget last year? Plain and simple this tells a lot. Yes a budget can go up based on trends and potential, but if your budget was $2,500 last year it will most likely not be $20,000 next year. 5. Where is your ministry going? Where is your ministry going philosophically? Numerically? Short Term? Long Term? Are you adding programs? EXAMPLE: Last year I was making a major shift in the way we did programming and hopefully creating awareness for outreach that needed to take place and our group was on the verge of a numbers boom. 6. Where is your church going? Are you in a time of growth, decline, budget cuts, or alternate focus? EXAMPLE: I have known churches who came to staff 9 months in and told them to plant on 10% of their budget being cut. I have also known chuches who have started a second campus or planted a church and shifted funds and focus mid year. 7. What is the financial culture of your church? How have others past and present made budgets and presented them? EXAMPLE: I stole the spreadsheet format others had used in the past so that I would not be foreign in my presentation. 8. What are your must haves? While we are know that a new Wii would impact eternity because of the lives it would change, if you are honest with yourself your money may be better spend on leader appreciation. EXAMPLE: While I have always had the dream for technology and part-time staff, those things didn’t happen in year one and may never happen. 9. What is your relationship with the person/group making the final decision? Are you the new guy? Are you the seasoned veteran? Are you always asking forgiveness? Are you the guy who can do no wrong? EXAMPLE: Perception is reality so if you are the new guy, know that you have earn trust and credibility. If you have let this group down before you may have to regain their trust. No matter which guy you are you cannot go wrong with organization and clarity in your thought and presentation. I hope this helped somebody. If you have questions or comments comment away and let the conversation begin.